Member clubs of the Fédération Cynologique Internationale recognise three separate breeds with similar standards. Other kennel clubs register it as one breed with three variations. The Griffon Bruxellois or Brussels Griffon is a breed of toy dog, named for their city of origin: Brussels, Belgium. 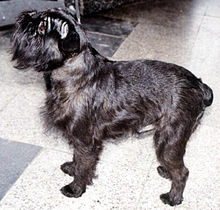 The Griffon Bruxellois may refer to three different breeds, the Griffon Bruxellois, the Griffon Belge and the Petit Brabançon. Identical in standard except for coat and colour differences, in some standards they are considered varieties of the same breed, much like Belgian Shepherd Dogs. The breed has never been numerous or popular, but had a brief vogue in the late 1950s, and now is generally an uncommon breed. There has been a recent increase in interest in the United States due to the appearance of a Griffon in the movie, As Good as It Gets, and also because of a general increase in interest in toy dogs. 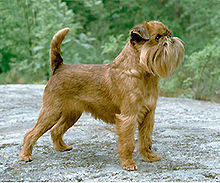 The Brussels Griffon is typically a small breed with a sturdy frame. The average adult Griffon stands from 9 to 11 inches (230–280 mm) tall, and weighs 8 to 10 pounds (4–5 kg). They have domed heads, short noses, and an underbite. Their human-like facial features are often likened to that of an Ewok. The Griffon comes in two coat variants, wiry/rough and smooth coat. Their hair (not fur) can be red, black and tan, or black and reddish in color. The short hair Griffon requires little grooming while the wiry/rough coat Griffon requires weekly grooming attention. The Griffon Bruxellois is known to have a huge heart, and a strong desire to snuggle and be with its master. They display a visible air of self-importance. A Griffon should not be shy or aggressive, but they are very emotionally sensitive, and because of this, should be socialized carefully at a young age. Griffons should also be alert, inquisitive and interested in their surroundings. Griffons have relatively few inherited health problems, but should still be tested for congenital defects, the most serious of which are Syringomyelia (SM) and Chiari-like malformation (CM). The typical life span of a Griffon is somewhere in the range of 10 to 15 years. Griffons usually have no trouble whelping on their own, but sometimes complications can necessitate a Caesarean section. The size of a litter is typically 1-3 puppies. 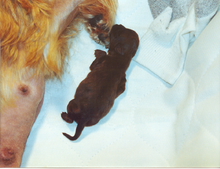 The size of the litter often determines the extent of these complications. Litters of six are not unheard of. When they are born, the puppies only weigh a few ounces (about 100 grams) and are small enough to fit in the palm of an adult's hand. They can get leg and heart problems from an early age. One issue that is typically fatal for the puppies is having a cleft palate. It results in the puppy not receiving nourishment from the mother and eventually starvation. It is uncommon but, depending on the size of the cleft, it is possible for the puppy to survive whereas it becomes older surgery can be done to close the hole. Most have large eyes that may require rechecks from a veterinarian. Glaucoma - Glaucoma can also be a common issue amongst Griffons owing to the breed's facial features and eye size. Although Griffons have a shortened snout, heat stroke is not a major concern for them as it is with other flat-faced breeds. The breed's shortened muzzle may cause respiratory problems in extreme heat, but overall they tolerate both hot and cold weather well. As with any breed, owners must use common sense and not leave them outdoors without protection from the elements or subject them to rigorous exercise during extreme temperatures, so let them in your house for cool air and some water. Not all dogs with SM have clinical signs. The presence of signs is correlated to the width of the syrinx and extent of spinal cord dorsal horn damage. Syrinxes can progressively expand and a dog which is asymptomatic in early life may eventually experience pain. The American impressionist painter Mary Cassatt kept Brussels Griffons and frequently portrayed them in her paintings. In the film Gosford Park, as William McCordle's dog. In the film Teaching Mrs. Tingle, as Mrs. Tingle's dog. In the film First Wives Club owned by Diane Keaton's character. In the sitcom "Mike and Molly" Mikes mom's dog, Jim is a Brussels Griffon mixed with a Chihuahua. The Southern California craft brewery "The Bruery" brewed a sour brown ale called Griffon Bruxellois. The makeup for the Ewok characters in the film Return of the Jedi (1983) in the Star Wars universe was developed by make-up artist Stuart Freeborn, who built them from designs by visual effects director Joe Johnston using the image of the Griffon Bruxellois, a dog breed which George Lucas owned. ^ a b c "Brief Historical Summary from the Fédération Cynologique Internationale breed standards. (DOC file)". Fci.be. Retrieved 11 December 2017. ^ "American Kennel Club - Brussels Griffon History". American Kennel Club. Retrieved 2008-01-07. ^ "Account Suspended". Griffonclub1897.co.uk. Retrieved 11 December 2017. ^ "Welcome brussels-griffon.info - BlueHost.com". Brussels-griffon.info. Retrieved 11 December 2017. ^ "Brussels Griffon : Dog Breed Selector : Animal Planet". Animalplanet.com. Retrieved 11 December 2017. ^ a b "Brussels Griffon - Appearance & Grooming". Petwave.com. Retrieved 11 December 2017. ^ "Canine Inherited Disorders Database - University of Prince Edward Island". Upei.ca. Retrieved 11 December 2017. ^ "Purebred Breed Health Survey 2004". Thekennelclub.org.uk. Retrieved 11 December 2017. ^ a b c Weiss, Seymour N. Brussels Griffon: A Complete and Reliable Handbook. Neptune City, NJ: T.F.H Publications Inc.
^ "Mary Cassatt was a fellow griffoniac". NYC Brussels Griffon (self-published)). Archived from the original on 3 December 2013. ^ Elisabeth Donnelly (2006-11-10). "Hanging With". The Boston Globe. Retrieved 2007-11-27. ^ Tricia Romano (2006-12-11). "Fly Life Night Life Awards". Village Voice. Retrieved 2007-11-27. ^ Raynham, Doone (1998). The Griffon Bruxellois. Kingdom Books England. ^ Michael (2015-06-02). "Did Shih Tzus inspire the Ewoks from Star Wars? with cites". PoliteDog.com. Retrieved 2015-12-23. Wikimedia Commons has media related to Belgium Griffons. This page was last edited on 31 December 2018, at 17:14 (UTC).